Sightseeing tour of Old & New Delhi. Visit the Mandawa village with colorful mansions, temples, etc. Visit the Villages and Fort of Bikaner. Sightseeing tour of the desert city of Jaisalmer,. Explore the most romantic city of India - Udaipur. Explore the Holy city of Rajasthan - Pushkar. Enjoy an elephant ride at Amber Fort in Jaipur . Tourism and Rajasthan go side by side. As you take a tour of Rajasthan with us, you will explore so many new facets of Rajasthan. Whether it is the sand dunes or the massive forts and palaces, . you will realize that there is no other place like Rajasthan. For a traveler who is interested in the history, culture and the lifestyle of the people of the Oriental world, Rajasthan is just the perfect tourist destination Unlike what its barren scenery suggests, you will find that Rajasthan is the most colorful and interesting place inhabited by humans. An exotic land, a dream come true for the Western world, Rajasthan was home to the Rajputs, the martial races of India known equally for their love of arts and architecture as well as valor and chivalry. Fly from your country and arrive in Delhi, India, the erstwhile capital of 8 empires and now the capital of India with all the evidences of its glorious past intact along with the present. Upon arrival at Indira Gandhi International Airport, New Delhi, India, you will be Visit India representative. Then you will be escorted to the well-maintained & prestigious hotel, designated for you. After a traditional welcome with flower garland & Tilak at the hotel reception you will check into your hotel room. Freshen up and relax at the hotel. Spend rest of the day in comforts at the hotel. Enjoy a welcome dinner organized at the hotel. Stay overnight in comforts at the hotel. Have a very hearty breakfast at the hotel and then embark on a full day sightseeing tour of Old & New Delhi. During your tour to Old Delhi you will see Raj Ghat – the memorial site where Mahatma Gandhi was cremated; Jama Masjid – the largest mosque in India and the grand Red Fort – once the most opulent fort and palace of the Mughal Empire. Also enjoy the cycle rickshaw ride from Jama Masjid to bustling bazaars of Chandani Chowk. During your sightseeing tour of New Delhi you will see the Humayun’s Tomb, Qutub Minar, imposing India Gate – a war memorial, Parliament House, President House. Drive along the ceremonial avenue – Rajpath. After exploring the city of Old & New Delhi, return to the hotel. Enjoy a gala dinner at the hotel. Stay overnight in comforts at the hotel. After very hearty breakfast at the hotel, drive to Mandawa located in the heart of Shekhawati region, Rajasthan, India. On arrival, Our representative will assist you to transfer to the hotel. In the afternoon, visit the village with colorful frescoed mansions, temples and charming little shops. Sumptuous dinner and overnight stay will be at the hotel. After very hearty breakfast at the hotel, drive to Bikaner, Rajasthan, India, a desert town surrounded by a high wall, which was once an important staging post on the great caravan routes. On arrival, Magical India Tours representative will assist you to transfer you to the hotel. Freshen up and relax at the hotel. In the afternoon, visit the village and Fort. Sumptuous dinner and overnight stay will be at the hotel. After hearty breakfast at the hotel, embark on the sightseeing tour of the desert city of Jaisalmer, Rajasthan, India. Visit the 800-year old sandstone fort that dominates the entire town with its presence atop the Trikuta hill, the Jain temples dating back to the 12th and 15th centuries and unique mansions with stone-carved facades with delicate sculptures, stone lattices and dainty little balconies. Enjoy a camel safari to Sam Sand Dunes up to sunset point. Dinner and overnight stay will be at the hotel. Freshen up and relax at the hotel. In the evening visit massive Mehrangarh Fort, the Jaswant Thada, which harbors the royal cenotaphs, built in the marble and the Mandore Gardens, a memorial for former rulers of the area. Dinner and overnight stay will be at the hotel. After hearty breakfast at the hotel, drive to Udaipur, Rajasthan, India en route visiting the Jain temples of Ranakpur. On arrival, Visit India representative will assist you to transfer you to the hotel. Freshen up and relax at the hotel. Dinner and overnight stay will be at the hotel. After hearty breakfast at the hotel, visit the City Palace with its lavish collection of artifacts, intricate miniature paintings and sculptures, the Jagdish Temple in the heart of the city dedicated to Lord Jaganath and stroll around Saheliyon-Ki-Bari, a beautiful garden with fountains. In the evening, take a boat ride on the Lake Pichola and see the sunset. Dinner and overnight stay will be at the hotel. Have a very hearty breakfast at the hotel and then drive to Deogarh en route visiting Ranakpur Jain Temples. Enjoy lavish lunch at Maharani Bagh. Upon arrival in Deogarh, stay overnight at Deogarh. Have a very hearty breakfast at the hotel and then drive to Khajrela. Dinner and overnight stay will be at Khajrela. Have a very hearty breakfast at the hotel and then drive to Pushkar – the holy city of Rajasthan, India en route visiting Dargah at Ajmer. Upon arrival at Pushkar, Visit India representative will assist you to transfer you to the well-maintained and prestigious hotel, designated for you. After hearty breakfast at the hotel, drive to Jaipur, Rajasthan, India. On arrival, Visit India representative will assist you to transfer you to the hotel. In the afternoon visit Jaipur's signature landmark, the multi storied Hawa Mahal with the bustling bazaar below, the Jantar Mantar observatory built in 1728 and the City Palace Complex and prosperous museum. Sumptuous dinner and overnight stay will be at the hotel. After hearty breakfast at the hotel, visit the grand Amber fort, which encloses superb palace and beautiful temple in marble dedicated to the fearsome goddess Kali. Enjoy an elephant ride up the fort's ramparts. Spend rest of the day at leisure. Sumptuous dinner and overnight stay will be at the hotel. After hearty breakfast at the hotel, drive to the 'City of the Taj', Agra in the state of Uttar Pradesh, India. En route, visit the Imperial 'Ghost City' of Fatehpur Sikri constructed of sandstone and built by Emperor Akbar. On arrival, Visit India representative will assist you to transfer you to the hotel. In the afternoon take a city tour and visit one of the 'wonders of the world', the Taj Mahal with its majestic marble domes and elegant minarets. Thereafter, visit the Agra fort built by Emperor Akbar in 1565 and the marble tomb of Itimad-Ud-Daulah, if time permits. Sumptuous dinner and overnight stay will be at the hotel. After an early morning breakfast at the hotel, embark on city tour of Agra city and visit white marble marvel Taj Mahal – the symbol of eternal love and grand Agra Fort. Also visit the marble tomb of Itimad-Ud-Daulah which is considered as the Baby Taj. This baby Taj was built by Empress Noor Jehan in the memory of her father. In evening you will be transferred to the railway station so that you can board overnight train for Varanasi in state of Uttar Pradesh, India. Dinner will onboard the train. Upon arrival in Varanasi this morning, Visit India representative will assist you to transfer you to the hotel. Freshen up and relax at the hotel. Spend rest of the day at leisure or in your own individual activities. Enjoy a gala dinner at the hotel. Stay overnight in comforts at the hotel. In the early morning enjoy a boat excursion on the River Ganga, a ferry pilgrimage from Ghat to Ghat. 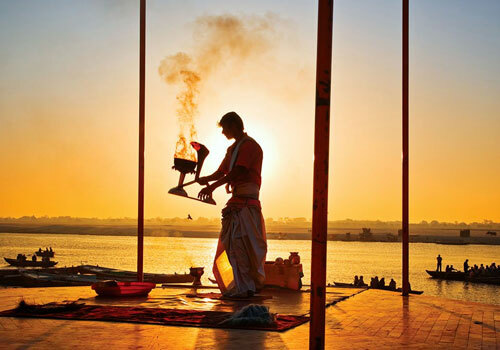 Take a holy deep in the River Ganga and offer pray to the rising sun. Visit the cremation Ghats and witness the living traditions of one of the world’s oldest and most important religions. Return to the hotel and have healthy breakfast. Later visit to the Sarnath – situated at the distance of five miles from the luminous city of Varanasi, Uttar Pradesh, India. Sarnath is one of the holiest Buddhist sites in the world, where Lord Buddha preached his first oration. Witness the ruins of a once flourishing Buddhist monastery. Also visit a fine Museum which houses an excellent collection of Buddhist art and sculptures found at the site. After exploring the holy city of Varanasi return to the hotel. Enjoy a gala dinner at the hotel. Stay overnight in comforts at the hotel. Have a very hearty breakfast at the hotel. Today you will be transferred to the airport to catch flight for Delhi, India. Upon arrival in Delhi, Visit India representative will assist you to transfer you to the well-maintained and prestigious hotel, designated for you.